We will try to keep this news page current by deleting items more than three months old. Fr Ambrose, Br Basilio, Br John of the Cross and Br Cyprian travelled to Tamale for the ordination to the priesthood of Fr Lambert Bakourebe. Fr Lambert was one of our former students and spent some years with the Olivetans Benedictines at Bologna after completing his studies. 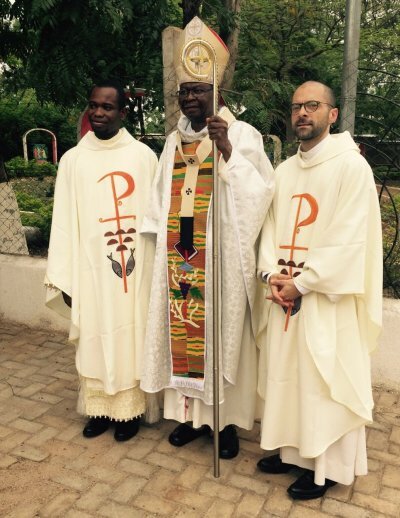 He has now been ordained for the Tamale Archdiocese in northern Ghana. Fr Lambert (left) is shown here with Archbishop Philip and Don Luigi, OSB-Oliv., who came from Rome to attend the ordination. In August, Bede Kilgallon, former superior of the monastery and one of the founders of Kristo Buase, paid us a visit as part of the Silver Jubilee celebrations. 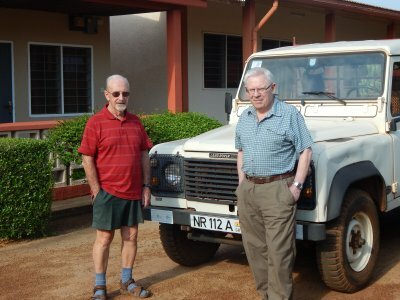 He is pictured here with Br Trevor Robinson, M.Afr, at the Missionaries of Africa Provincial House in Tamale. We first met Affiah Baah about ten years ago when she was brought to the monastery on her grandmother's back. Affiah was born with club feet and was unable to walk. 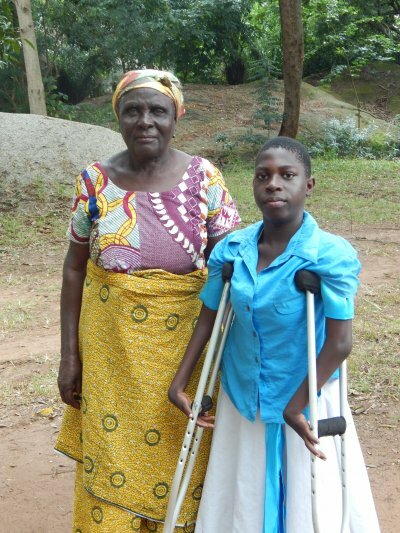 Now, through the help of benefactors in the UK, she has received corrective surgery and is pursuing her studies at the Immaculate Heart of Mary School near Kumasi. 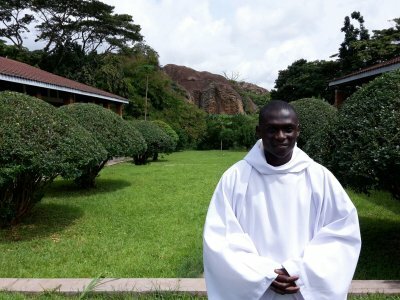 The day before the profession, Abbot Francis clothed Max-Romeo Osei of Kumasi as a novice, giving him the name Br Louis. He is named after the great Catholic orientalist and disciple of Bl Charles de Foucauld, Louis Massignon, whose anniversary fell on that day. 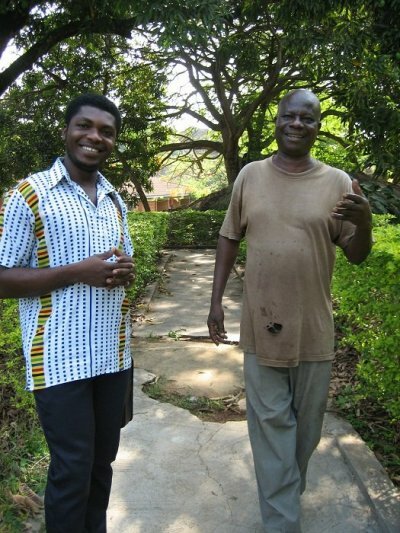 Br Louis (left) is shown here with Br John Owusu. 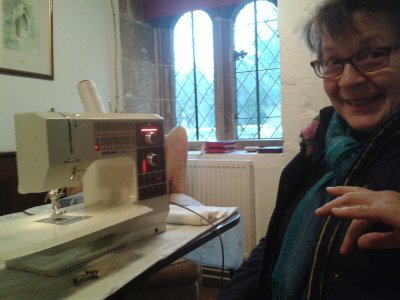 Br Louis is training to be the monastery-tailor and Sally Mercer, who met him as an aspirant when she visited Kristo Buase in 2014, has donated a very fine electric sewing-machine to help him in his work. 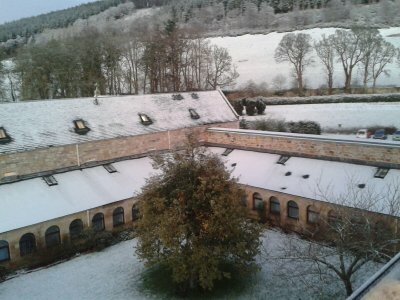 Fr Giles Conacher of Pluscarden spent six weeks at Kristo Buase this year while Fr Ambrose was on home leave in Scotland, enjoying his first snow in several years. Fr Giles produced this calendar for our friends and benefactors. You will find Fr Giles himself on the December sheet. 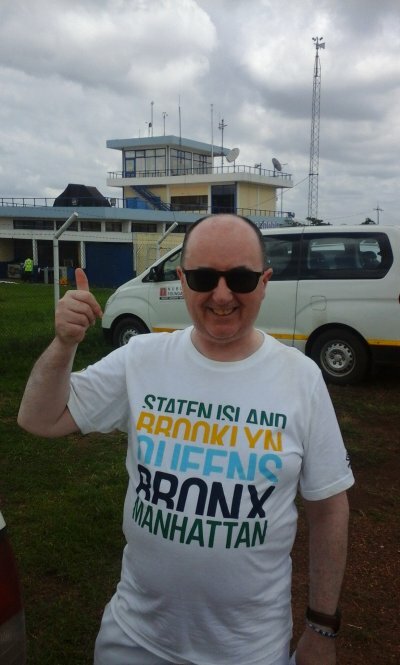 While at Prinknash Abbey, Fr Ambrose attended a meeting of "Teams of Our Lady", in preparation for an exploratory visit to establish a Teams group in Techiman Diocese. This is a lay movement composed of married couples who meet regularly to strengthen their practical living of the faith and to share the difficulties they face. 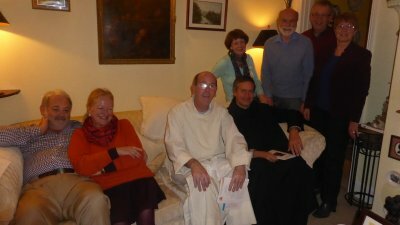 Pictured are (left to right), Adrian and Karen Jones, Fr Martin McLaughlin, OSB (Chaplain); Fr Ambrose (in black); Robert and Mary Jones; Helena and Paul McClosky. Missing from the photo are Maddie and Lindsay Read. The Building Fund for a new Church and Guesthouse now stands at a little over 30,000 British Pounds. We will need to make a decision soon as to whether to keep appealing through difficult economic times (Ghana is in a state of financial crisis, awaiting an IMF bailout) our scale down our plans. One possibility is to build a small chapel which could later be converted to a Chapter House when funds are available for a more ambitious Church. The growth of the community is making some form of enlargement urgent. 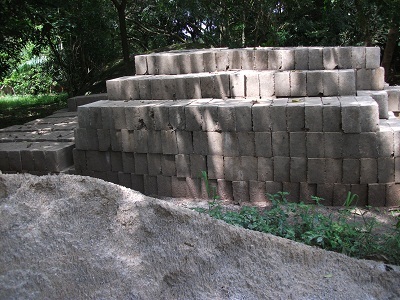 We have started moulding blocks for the foundations of the church. How can I become a Friend of Kristo Buase? 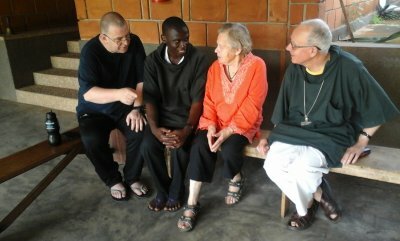 In 1989, just before arriving in Ghana, Fr Martin Symons announced in the monastery's newsletter the launch of a new informal association - the "Friends of Kristo Buase Monastery". There is no annual subscription and no application form, our Friends are simply those who have helped us with their prayers, donations and practical help. For them, and for all their needs, let us pray to the Lord. R/. Amen. Please help us to keep these lists up to date if names are missing. If you are a UK tax payer, we can gain an additional 25p in the pound on your gift as recovered tax from the Inland Revenue if you fill out a Gift Aid form. This form continues in force for all future donations to the Ghana Sunyani Monastery Trust unless you cancel it. This year (2014) we received more than GBP 8,000 from the Inland Revenue as refunded tax through the Gift Aid scheme. 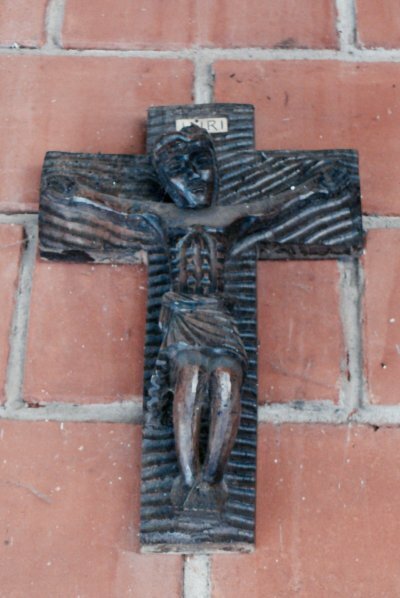 Please return the completed form to; The Bursar, Prinknash Abbey, Cranham, GLOUCESTER, GL4 8EX.